The best protein shakes like Shakeology are a healthy drink for everyone’s daily lives. However, making them requires keen observation on the tool used to ensure high quality is achieved. The best blenders for Shakeology and other protein shakes have certain properties that may differ from any other blender. Here is a list of what to look for in a blender for protein shakes the next time you shop for one. You need lots of power. A high-speed motor is one of the key feature of a perfect protein shakes blender. Such a motor allows the use of frozen fruits in place of the hard to find fresh fruits as it can easily crush the ice covering such fruits. Such makes it easier to purchase fresh fruits in bulk, store them in your freezers and use them frequently make more shakes. The high-speed motor also eliminates the need to pre-cut the ingredients before using the blender as the motor can easily pulverize the fruits’ seeds for better taste and texture. Do not go for cheap motors, as they will burn out from regular use. On the contrary, high quality motors would run several times within a day without even a sign of burning out. The blender needs to be stable. The blending process requires a stable blender that will not fall off once you have started blending. Always check the blender base to ensure it is made of metal instead of a piece of plastic. Metal bases give any blender the stability required to withstand the vibrations from a high-speed motor used for making your protein shakes. Make sure it is a good size for you. A perfect blender for smoothies must have the correct pitcher size and of the right material. For best results, the blenders’ pitcher size should be a minimum of 5 cups or 40 oz., but the bigger the pitch size, the better for you. Some blenders may have more than one jar with differing sizes, which adds to the pitcher capacity of your blender. The pitch pot should not be made of a brittle material such as glass. Rather, it should be a material able to sustain high pressure, high rotating speed and should be lighter. Plastic is the best material that meets these quality parameters. The ease of cleaning is another feature to consider in your blender. Avoid the blenders that require disassembling before you clean. Go for blenders that would be easily cleaned by rolling a combination of hot water and dish washing soap in the jars for a minute. Our choices have all the above requirements…. The Nutri Ninja Pro (BL456) is a stand alone blender, used to process whole fruits, vegetables, ice, and seeds. It is used for those who want healthy drinks and want the convenience of a single appliance. Unlike other blenders or juicers, this machine does not separate pulp from the liquid. Users get all the nutrients of whole foods. Powerful 900 watt motor. This machine is designed to process whole foods, including the skins. It can also process ice, seeds, and frozen fruits right from the package. BPA free containers. The main processing jar and the take along containers don’t contain harmful toxins. Take along cups. The Nutri Ninja Pro comes with two take along containers in the 24 ounce and 18 ounce sizes. the containers feature sip and go lids, to easily take healthy drinks along on a commute to work or on a short trip. Attractive design. The blender features a brushed steel finish, with attractive black accents. It looks good on the counter, so there is no need to store the machine in the cupboard. Buyers say the machine is easy to use and produces smooth drinks, shakes, or juices. Clean up is easy, as there is only one container to wash. It also goes in the top rack of the dishwasher, for even greater convenience. There have been some concerns about the juicer leaking. Users recommend not overfilling the main jar and cleaning the seal properly with soap and water. They claim all juicing machines will leak if overfilled or if debris gets caught up in the seal. Healthier drinks, shakes, or smoothies – By processing the whole fruits, seeds, or vegetables, users get all the nutrients of the whole foods, rather than just from the juicy parts. Easy to use and clean – Using a single container for processing makes the machine easier to clean and maintain, after use. The cup for processing can even go in the top rack of the dishwasher, for greater convenience. Small footprint – This processor has a small footprint, so it can easily fit on the counter among other appliances. It will also easily store in the cupboard, if desired. Great price – This juicer is a fraction of the price of larger, bukier models that separate the pulp. The advantage of this machine is that users can make smoothies and shakes, as well as healthy juice drinks, from a single machine. Convenient containers with lids – The Nutri Ninja Pro (BL356) comes with two take along cups, which can be stored in the refrigerator when not being used. 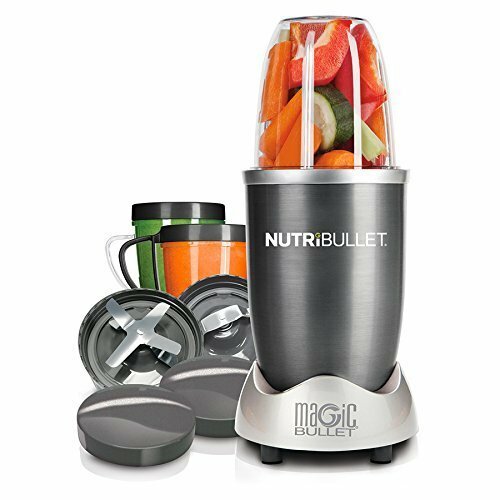 If you want to make healthy and nutritious drinks that can help you have healthy and younger-looking skin, relieve joint pain, help you lose weight, and even fight and prevent diseases, then the right product for you to use is the Magic Bullet NutriBullet 12-Piece High-Speed Blender/Mixer System. What makes this blender so impressive is its extractor technology. The blender’s extractor technology utilizes a motor with cyclonic action that is powered by 600 watts of electricity and uniquely designed extractor blades. This technology works by breaking down and pulverizing the skins, seeds, and stems, which are the parts that carry the highest amount of nutrition. To make a smooth, tasty, and nutritious drink, simply add boosts such as herbs, seeds, and nuts, vegetables, and fruits, along with some water, and there you have it. If its technology is not fascinating enough, the fast rate at which you can prepare and clean the blender will blow your mind. Now, you are probably asking yourself why you should eat extract foods. The answer is simple. Extract foods and drinks are very nutritious, and therefore, suitable for everyone it does not matter whether they are young or old, or with a perfectly healthy body or not. Extract foods and drinks are great as they are already predigested. This means that when they enter your body, they are effortlessly absorbed into the blood. In the state that they are in, extracted foods eliminate the dependence on proper chewing, effective digestive enzymes and stomach acids to properly digest food. Therefore, you need a NutriBullet blender to help you in preparing delicious and nutritious extract foods and drinks. Below are the items included in the NytriBullet 12-Piece set blender. Able to shred tough skins, bust open seeds, break down the toughest ingredients and crack through stems. Your health should be your first priority. For this reason, you need to eat healthy foods and drinks. The Magic Bullet NutriBullet 12-Piece High-Speed Blender/Mixer System will help you prepare nutritious foods and drinks that will help you live healthy. Many individuals make resolutions to clean up their diet and exercise to be more healthy. Some mistakenly think this requires a tremendous output of effort on their part. Instead, it takes a sound nutrition plan and the proper tools to be successful. Using the Ninja Professional Blender & Nutrition Ninja Cups you can create a variety of healthy meals for your family to enjoy at home, school and work. High tier brands such as VitaMix or Blender pop up when seeking blender recommendations. They come with a high rated reviews. However, few can shell out the $500 price tag required to obtain them. Enter the Ninja. It has great product ad placements airing on network television, an attractive price point and a wide range of useful features. 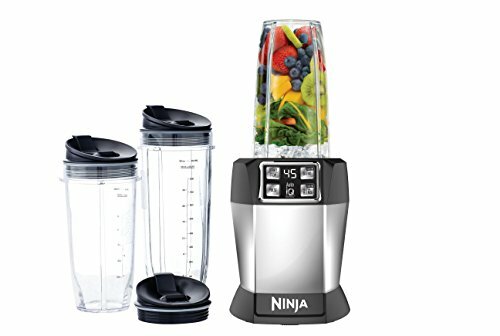 You have likely seen one of the commercials and may be considering purchasing one of the Ninja blenders. Let’s take a closer look at what the Ninja has to offer. 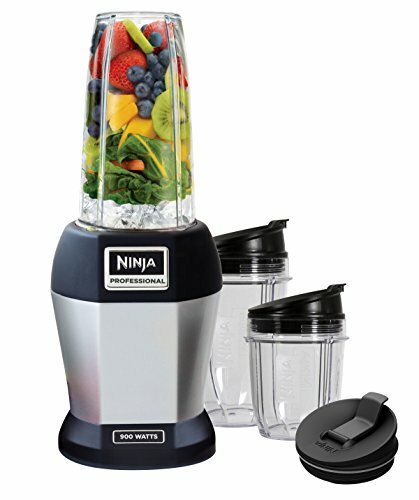 The Ninja Professional Blender & Nutri Ninja Cups are available in multiple speeds. This includes models delivering between 1,000 and 1,500 watts. This is enough force to whip and puree a variety of ingredients. A common complaint of blenders is their lackluster performance when chopping ice. However, the Ninja blender breezes through ice effortlessly making it perfect to whip up margaritas for your next party. It powers through fibrous vegetables such as kale and spinach for your healthy green smoothies. The blender carafe is spacious at 72 ounces allowing you to create a full supply of smoothies and drinks in one session. The pitcher is built of durable materials. The blades are sharp and won’t rust on you. The attachments, lid, pitcher and other accessories are made of BPA free plastic. The parts are also dishwasher safe so you can feel comfortable tossing them in for a cycle to clean. The Nutri Ninja cups hold 24 ounces of liquid. They also come with sip and seal lids. These cups are perfect for grab and go drinks and safely contain your favorite beverages as you stroll out the door. The footprint is small enough to not consume valuable real estate in your kitchen. Its usefulness will not relegate it to a forgotten cabinet, never to be used again. Instead, you will find you can use the Ninja Professional blender daily. It makes more than smoothies. You can create your own salsas, pasta sauces, and even chicken salad. The versatility makes it a wise buy. There are several blenders in the market, but Epica Personal Blender with Take-Along Bottle stands out among the rest. 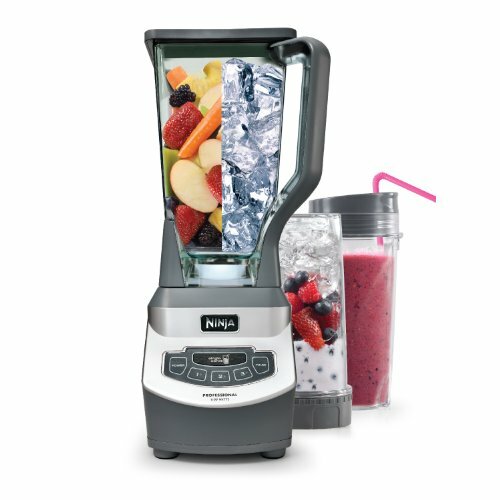 This unique blender ensures you can make a blended drink at the go in a safe, healthy, and faster way. Epica Personal Blender comes with a drinking jar attached at the base allowing the users to blend and carry the drink with them. All you have to do is twist the base when ready to go with your blended drink. One of the standing out feature of the Epica Personal Blender with Take-Along Bottle is a BPA free mixer jar that is break resistant. This jar is very light and fits most of the car heating conditions, which makes it safe to carry with you in the vehicles whenever you are going without worrying about breaking at any temperature. The one glass jar blender is also easy to clean, saving you precious cleaning time and efforts. With this blender, you are assured of sticking to your diet schedule since the 20 oz., take-along bottle is large enough to carry your daily drinks. The mug is air tight sealable so it does not spill the drinks in the bag or car. The Jar’s lid perfectly snaps on the bottle during storage making the jar occupy smaller space and keep all parts intact all the time. Epica Personal Blender with Take-Along Bottle has a powerful motor and reliable heavy-duty blades made of stainless steel for easier cleaning and great healthy blending. The motor allows for 300 watts output, able to reach 23,000 revolutions a minute, enough to pulverize any fruit in the blender with much ease. This high speed, high power motor means users can make their own sauces, soups, and purees without precutting the ingredients or worrying of the blender stalling on some hard fruit seeds. The high rotating blades easily crush ice and frozen fruits without any hitch. Epica Personal Blender with Take-Along Bottle is made to last ages. The high quality materials ensure you get more services from the blender, which guarantees you value for the investment. You can easily make you favorite drinks even three times a day without breaking this wonderful blender down. Consistency is guaranteed as the blender delivers high quality blending experience whenever you are. The blender comes with a 2 year high quality service warranty, reducing the risk of malfunctioning for such a long time. The Nutri Ninja Auto iQ (BL482) is a small, powerful blender designed to process whole fruits and vegetables. Buyers who purchase this product tend to use the appliance for healthy drinks, or for liquids to use in healthier recipes. The Ninja iQ can break down fruits, vegetables, ice, and seeds. Ease of processing – The main container for processing simply twists on and off the machine, for easy serving. Ease of clean up – There is one container used for processing, to wash between used. Users don’t have to wash multiple parts, like they do with a juicer. This makes using the machine faster and easier. No guesswork – The Nutri Ninja iQ blends foods automatically, using one of the handy settings. There is no guess work for users. Simply choose the blend function for smoothies or the ultra blend for juice like consistency. Less space on the counter – The Ninja iQ takes up less space on the counter top, than typical juicing machines. The small footprint of the machine makes it handy to grab and use at a moment’s notice. It’s small enough to be stored in the kitchen cabinet, when not in use. Healthier drinks – The Ninja iQ processes whole fruits and vegetables. This means there is no part of the fruit left over. Users can get all the nutrients in healthy, tasty drinks, without wasting any part of the fruit. Typical juicers separate the skin and leave the fiber for users to dispose of or use in creative ways. This is often inconvenient, unless users want baked goods or treats, as well as juice. Using the entire fruit or vegetable provides more vitamins and minerals, for healthier drinks and smoothies. BPA free Ninja cups. This model features 3 sizes: 32 ounce multi serve, 24 ounce, and 18 ounce. The cups are take and go, as they come with sip and seal lids. Auto iQ programs. Users simply select one of the three settings and let the machine do the work. No guesswork is needed to use these functions. Powerful 1000 watt motor. This makes processing whole fruits, seeds, and ice a simple task, with no mess. Smooth processing. There is no foam residue left when whole fruits and ice are processed. Buyers say the Nutri Ninja iQ is about as quiet as more expensive brand juice blenders. It takes less than a minute for many drinks, so most users don’t find it a problem. It’s easy to use, easy to clean, and looks good on the counter. There is no need to put it away or hide it after use. The Nutri Ninja Auto iQ (BL482) is a good value overall. If you to choose the best blender for Shakeology or other protein shakes, choosing any of these will give you exactly what you need!